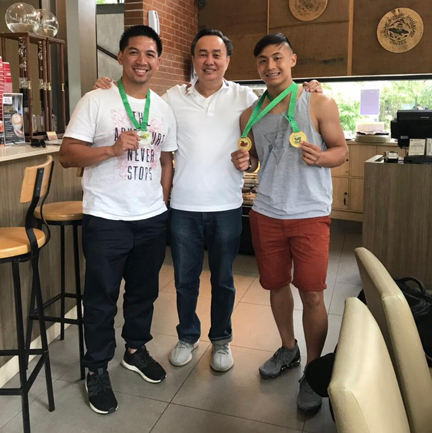 Up-and-coming Patrick Coo (right) displays his two gold medals in the Men Junior and C1 events and Incheon Asian Games champion and London Olympian Daniel Caluag (left) shows his silver medal in Men’s C1 they won at the Asian BMX Championships in Kuala Lumpur, with PhilCycling President and Tagaytay City Rep. Abraham “Bambol” Tolentino personally overseeing their performances. Caluag finished fourth in the Men’s Race after skidding in the first corner of the track. Both Caluag and Coo are based in the US.